This helmet is what I call a blank canvas. The matte black TZ-R by Shoei is as simple as they come in appearance and will happily take your stickers, reflectors, paint, or whatever else you want to use to personalize it. Shoei's X-11 Kiyonari helmet graphics are aggressive and uncompromising, which might be just the attitude you want on the road. We do, after all, have to ride more defensively than any cager. Our reflexes must be sharp and our actions bold. 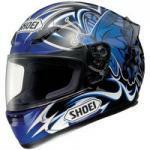 Shoei is known as an industry leader when it comes to making stylish but safe helmets. This one is no exception. The 'Flutter' presumably refers to its aerodynamic styling. This has been tested extensively with riders. 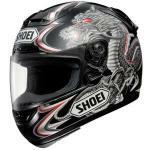 Shoei claims this leads to a less turbulent ride due to the integrated upper and lower air intakes.